Building a hay wagon deck is somewhat challenging, but good carpentry skills make the job easier. Most hay wagons, pulled with a tractor or the bumper hitch on a pickup, are built on a four-wheeled trailer chassis. People occasionally use an old pickup chassis in an attempt to save money. This practice is not recommended because a pickup chassis is not built for towing and it often doesn't follow in a straight line. It is also heavy and adds unnecessary weight to the trailer. New chassis for hay wagons are available from farm-equipment dealers and deck-construction plans are located on the North Dakota State University website. Determine deck length by measuring distance between bolster irons on the wagon chassis. Bolsters are short vertical pieces welded to the chassis and used for deck attachment. Cut 4-inch by 8-inch wood stringers to the predetermined length with a circular saw. Stringer length is the distance between the bolster irons and an additional two feet on each end. Bore 1/2 inch holes in the stringers with an electric drill and fasten the stringers to the bolster irons with 1/2 inch by 4-1/2 carriage bolts and nuts. Determine the required number of 4-inch by 4-inch cross sills. A cross sill is fastened across both ends of the stringers and spaced approximately 4 feet apart down the wagon length. Spacing widths depend upon wagon length. The sills need to be evenly spaced along the stringers. Cut the required number of cross sills to an 8 foot length and fasten to stringers with 1/2-inch by 12-inch carriage bolts and nuts. Cut required number of 1 inch by 12 inch rough-cut boards to the required length for the deck floor. Lay the planking across the sills. Build two wood clamps by bending four metal straps to fit on the top and edge of a deck board. Use a bench vise and a heavy hammer to make the bends. Drill a 1/2-inch hole in the metal strip on the opposite end from the bend. Fit the metal pieces on the two sides of the deck toward the end. Run an all-threaded 1/2-inch rod across the deck and through the holes in the metal straps. Screw 1/2-inch nuts on each end of the rod. Draw the deck planks together by tightening the nuts on one end of each rod. The plank edges should just touch each other and not be pulled tightly together. Wood expands when wet and if the planks are fitted too close together, the deck will become uneven. Measure diagonally across the deck in both directions with a measuring tape. If the two measurements are not equal, the deck is not square. If necessary, square the deck by tapping on the ends of the deck planks with a hammer. Lay a piece of angle iron across each end of the deck. Secure the ends of the two outside deck boards to the cross sills by running 1/2-inch by 6-inch bolts through the angle iron and through previously drilled holes in the deck boards and cross sills. Screw nuts onto the bolts and tighten with a wrench. Continue securing the deck planks to each cross sill. Where cross sills intersect the stringers, use 1/2-inch by 14-inch bolts and run the bolts through the deck plank, cross sill and stringer. Attach a piece of angle iron across the ends of the two stringers with the same bolts used to attach the deck. These angle iron pieces will serve as steps for mounting the wagon. 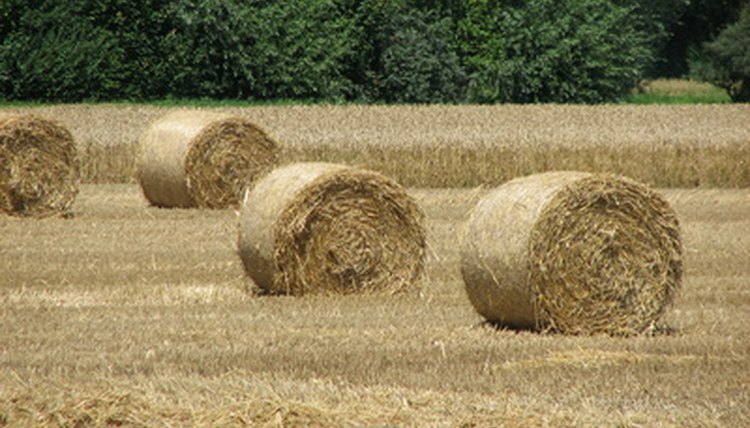 If you plan to use the hay wagon on public roads, check state and county regulations to ensure that you stay within width and length maximums when building the deck.